Coventry-based vehicle safety technology specialists, Innovative Safety Systems Ltd (ISS), have announced McCreath Taylor as their sole distributor and installation agent in Northern Ireland. Based in Lisburn, McCreath Taylor is headed up by David and Peter Johnston who have over 80 years experience in the waste management business in Northern Ireland and work with the majority of local councils there. A one-stop shop for vehicle safety technology ISS provides the full range of safety and lighting products such as reversing radars, CCTV camera systems, Hard Disk Recording, warning beacons and LED lighting packages. The company recently launched *Cyclear®, a new and effective Cyclist Warning Safety Device, which is being readily adopted by local authorities and private waste contractors across the UK, and is now available in Northern Ireland via McCreath Taylor. ISS RX3 DVR Hard Disk Recording equipment was installed to a Scarab sweeper for Derry Council last August, the first authority in Northern Ireland to use the technology. 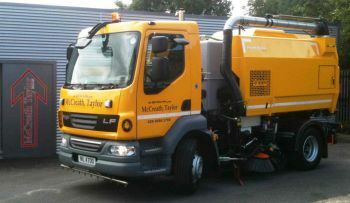 Since then McCreath Taylor has fitted the equipment to the authority’s new fleet of 8 sweepers, comprising two 15 tonne Scarab Magnums on a DAF chassis and six 12 tonne Scarab merlin road sweepers, also on a DAF chassis. McCreath Taylor has also gone on to fit the RX3 DVR camera system to every sweeper it has supplied to councils in Banbridge, Craigavon, Ballamoney and Armagh, as well as its own demonstration vehicle and CP Davidson refuse collection vehicles for Dungannon & South Tyrone Council.